Sunday was a day of redemption. As viewers around the country finished watching Tiger Woods complete a historical comeback to win his 5th Green Jacket at the Masters, No. 10 Texas A&M wrote their own redemption story at Olsen Field, claiming the rubber match against No. 22 Auburn by the score of 4-1. Saturday had been a rough, momentum killing day for the Maroon and White, as they allowed a struggling Auburn pitching staff to have their way with them at the plate. On the mound, The Aggies just didn’t have their best stuff, allowing seven runs to the Tigers. Sunday, however, the Ags struck back. Auburn scored first when SS Will Holland smashed an RBI single past a diving Braden Shewmake. For a moment, fans had to wonder if this was going to be a repeat of Saturday’s contest. But as starter Christian Roa, who was on a limited pitch count as he comes back from an undisclosed injury, gave way to Chris Weber and the bullpen, everything settled down for the Aggies. Holland’s RBI would be the only time that Auburn would score on the day. Texas A&M also did all of their scoring in just one frame, the fourth inning. The fourth inning has been a kind of catalyst for the Aggies this season. Whether it is because the lineup has generally seen the pitcher at least once by then or be it something else, the A&M bats come to life. Such was the case on a brilliant Sunday afternoon when Texas A&M put up all four runs in the fourth. It started with Mikey Hoehner sneaking a ball by a diving third baseman to tie up the game at 1-1. Auburn, trying to limit a big inning, went to the bullpen for LHP Elliot Anderson with Logan Foster coming up. There would only be one pitch in the at bat. “He threw me a fastball and I was hunting fastball,” said Foster after the game. Foster’s three run homer lifted Texas A&M over the Auburn Tigers on Sunday. Indeed he was. Foster lined the center cut fastball over the wall in right center field for a three run, game sealing homerun. While the scoring ended in the fourth, that was when A&M’s bullpen really went to work. A filthy combination of Chris Weber, Bryce Miller, Moo Menefee and Kasey Kalich had the Tigers striking out all day long. Menefee and Kalich, who hadn’t pitched yet in the first two games, combined to strike out seven batters in 2.2 innings pitched, crushing any dreams that Auburn might have had of coming into College Station and leaving with an SEC West series win. 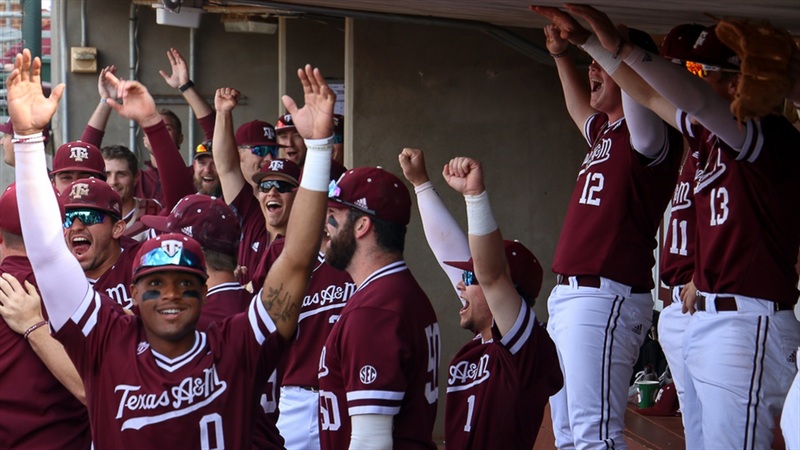 As the Aggies battle on an everyday basis to overcome the sluggish starts at the plate or on the mound, one thing is certain: They don’t give up. Texas A&M has very quietly put together an impressive resume, one that has seen the Aggies drop just one series all year long. While the SEC West canabalizes itself down the stretch, the teams that emerge to make a deep post season run are those that have timely hitting and lights out pitching. The Aggies are in position to do just that. So on a picture perfect Sunday, one that saw Tiger Woods acheive the ultimate validation for his resurrected career, the Aggies also validated themselves as a force to be reckoned with as SEC play reaches its final stages. Texas A&M will next head to Houston to take on the Cougars for a midweek matchup, before heading out to Columbia, South Carolina, for a Thursday-Saturday series with the Gamecocks. Good team win. Once again Childress was a master when he went to the pen. One of the best coaches in college baseball. We are lucky to have him!